Malawi Telecommunications Limited (MTL) was registered as a limited company in 2000 when government decided to split the parastatal Malawi Posts and Telecommunications Corporation (MPTC) into two entities, MTL and Malawi Posts Corporation (MPC) to allow the two to concentrate on their core businesses separately. In 2005 government through the Privatisation Commission finalised the privatisation of MTL. This was done in order to develop telecommunications further in the country to allow more Malawians access to communication services. The Privatisation of the entity would also ensure that the company accesses a wider range of financial and technical resources. With its headquarters at Lamya House along Masauko Chipembere Highway in Blantyre, MTL is now owned by Telecomm Holdings Limited (THL) which holds 80% and Malawi Government which retains 20%. THL is a consortium comprising Press Corporation PLC as the majority shareholder, Old Mutual, NICO Holdings and Investments Alliance Limited. MTL holds a 44.44% stake in TNM, a leading mobile company and 36% in Malawi Net, the pioneer ISP in Malawi. The company employs approximately 926 employees through its four major departments of Commercial, Technical, Finance and Administration and Human Resources. MTL offers a wide range of Information and Communications Technology (ICT) based products and services. It offers fixed wireline and fixed wireless voice and data products and services to residential and business customers. MTL, being the mother network, offers superior telecommunications solutions under HomeLink and BusinessPLUS brands. HomeLink provides communications solutions to homes and individuals through prepaid fixed ground line and fixed wireless phone service that allows residential customers to make and receive phone calls by topping up their phones with prepaid phone units. Furthermore, MTL also has liberty phones which are mobile and work just as any mobile phone but even better because of voice clarity and affordability of the rates. 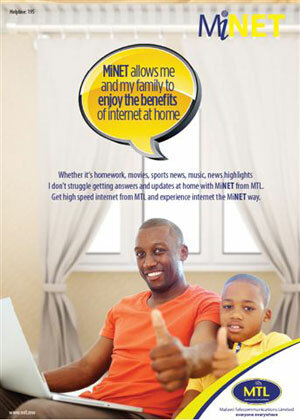 Topping it more, under HomeLink, MTL boasts of MiNET which is the brand name for all our internet solutions for home and individual use. This includes three technologies that we provide which are the EVDO (CDMA) dongle, ADSL and WiMAX dongle or modem and with these technologies we got the country covered. Whilst MTLs BusinessPLUS brand is there to simplify business through providing BusinessNET internet service and BusinessConnect VPN service. The postpaid phone service also falls under BusinessPLUSessentially providing a fixed ground line telephone service that allows business customers to make and receive phone calls and pay at the end of the month.